While browsing the addictive LoudPop Voyager I stumbled across a bike I hadn’t seen before. It was an Opel Motoclub, an unusual 500c thumper from between the Wars. 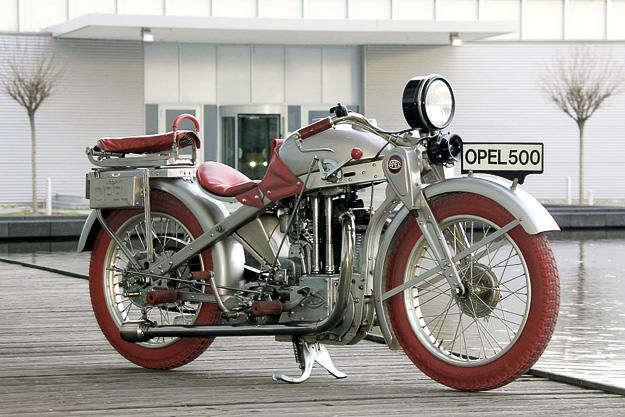 This machine was one of the highlights of the 1928 Berlin Automobil und Motorrad show: designed by Ernst Neumann-Neander, one of the pioneers of pressed-steel construction, it looked like no other motorcycle on the market. The metalwork was cadmium plated, and most of the leather and rubber was red—right down to the tires. Even more strangely, Fritz von Opel built a rocket-powered version too. According to historian Paul d’orleans of The Vintagent, “The rider activated the rockets with a foot pedal, after using the motorcycle’s engine to reach 75mph; Opel calculated that 220km/h (132mph) was then possible”.